I could write a book on Rajma.If there was one dish that was my ALLLLL time favourite it was the Punjabi Rajma Masala.It’s something I cook almost every week at home. The Punjabi Way of cooking Rajma Masala is to soak it overnight in water, boil it using a pressure cooker and mix bhuna masala made with Chopped Onions,Pureed tomato,Ginger, Garlic and milieu of fresh spices- including Cumin,Coriander and Chilli Powder.This dish is especially popular in the Northern states of India. Everyone has a Rajma recipe and a story with it, don’t we? I in fact have a number of stories! There was a time I ate(& relished) undercooked Rajma Masala with rice at my hostel in Vellore for 4 continuous years.It was the one dish that reminded me of home and even though it was badly made, i loved it.Such is the lure of Rajma! Though the best Rajma I have ever eaten is in North Indian State of Jammu when I was probably 10 years old.The taste and memory of that plate of hot steaming Rajma Chawal still lingers in my memory.It’s something I have been trying to re create since. I started cooking Punjabi Rajma when I got my own kitchen after marriage.My experiment with cooking the best Punjabi Rajma Masala has lasted almost 5 years during which time I tried all permutations and combinations. During my first month of marriage I valiantly invited some friends home with the promise of Rajma Chawal and those poor homesick beings agreed to grace me with their presence.I remember looking expectantly at their faces, hoping they would like it but I have to say not all experiments in those days resulted in a win. Never mind that though, its been 5 years since my maiden attempt at Rajma and since then I have perfected my Rajma Masala recipe and it’s time I shared it with you guys. In my recipe now,I use large red Rajma not the fast and easy to cook small version, or even the light coffee brown one.When cooked to absolute perfection-the kidney beans should butter soft and simply melt in your mouth. The gravy should be the right consistency -not watery and not to thick either.It should have a silky quality to it without being too smooth.The colour should be somewhere between light and dark brown ,veering more towards light brown. 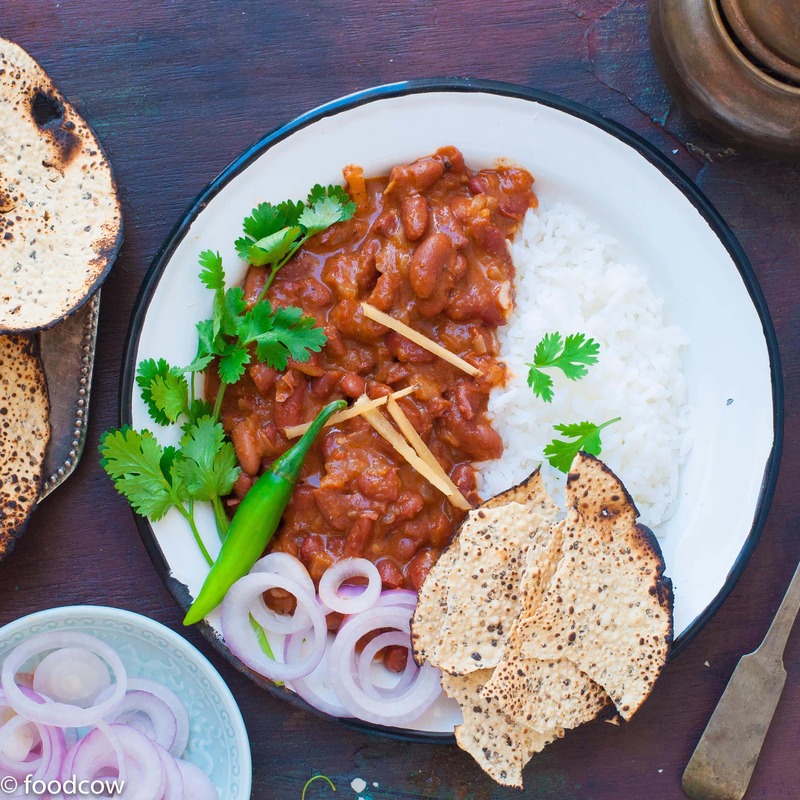 Some pointers to make the best Punjabi Rajma ever! Always make sure the Rajma/Kidney beans are no older than a month in the pantry.The older the Rajma the tougher it is to cook.So buy it in small quantities every month but never in bulk,unless you have a giant family. Second, Always soak your Rajma for atleast 4-5 hours and preferably overnight.I usually leave it in plenty of water the night before and cook it in the morning. Third,if you want a silky gravy which is not too smooth- Chop your onions very thin.If you have a food processor use that. and finally, Any dish is flat without the balance of sweet,salty and sour- so make sure you taste and check- Add salt if and when required. Though I am not a big rice eater there are two dishes that have to be eaten with Rice only!- Rajma and Kadhi! Rajma Chawal has an almost cult following in India.I can assure you the country is divided between – Rajma Chawal and Kadhi Chawal. Soak the Rajma for 4-5 hours or overnight. Pressure cook it along with 3 cups of water for 20-25 minutes on medium-high flame.Set aside. Add the Cumin(Jeera) & Asafoetida(hing).Let the Cumin Crackle. To this, add finely chopped onions, garlic,chilli and ginger.Cook till the onions are golden brown. Sprinkle in the garam masala, chilli powder and coriander powder.Cook for 30 seconds. Add the pureed tomatoes.Cook till the masala turns red and reduces to half.Keep sautéing.This step takes 10-15 minutes. You will know the masala is cooked when you see holes in the middle with bubbles forming on the surface.The oil will also separate and you will be able to see it on the surface. Once the masala is cooked add it to the pressure cooked Rajma along with the sugar.Mix everything together and check the salt.If needed add more. Return the Rajma to the heat.Pressure cook for another 10 minutes or till well cooked.Usually 2 whistles and no more. Remove from heat.Let the pressure release automatically. Check and add more water if the gravy is too thick.If its too thin- Cook it uncovered till desired consistency is achieved. Garnish with coriander and eat with Rice or parathas. Here are some other vegetarian dishes you will absolutely love!